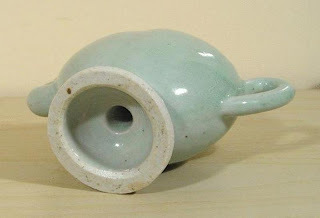 The Codugan teapot design using the inverted inside funnel is also used to make salt and peppers in clay. I've made dozens of these and sold them at shows. They are real good sellers and are a great way to start a dialogue with customers. People will pick them up, see that they are salt and peppers, but are puzzled. "Where's the holes?" they will ask. Sometimes I tell them they're for people on limited salt diets. But then, I show them how they work and they love it. 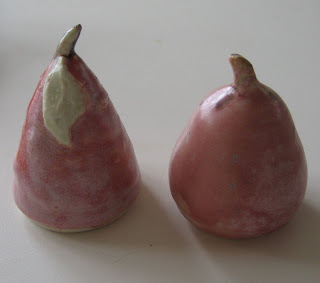 I usually make them in the shape of pears, since the form lends itself so well to this form, but I've also made them in many different designs. 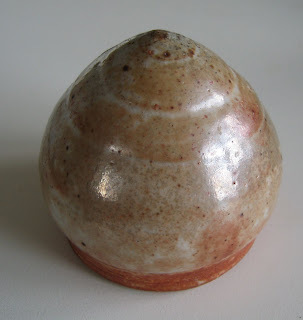 Here's a salt made by Illinois potter, Paul DreSang. Beside the 'leather' bags, Paul also makes salt-fired wheel thrown work. He made some pieces available for purchase at the workshop and I bought two pieces which I use nearly every day. 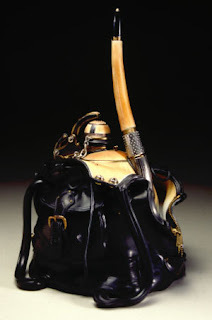 Pictured is a DreSang piece that looks like a rather unique teapot sitting inside a very convincingly-made collapsed black leather bag. The zipper and metal buckles look real, but they are also made of clay. The piece is quite large and is part of the Smithsonian's Renwick Gallery in Washington D. C. It is in the permanent collection and is on display occasionally. The story goes that Lord Cadogan, 1675-1726, fell in love with these little Chinese wine pots and imported them into England to serve tea. The story may or may not be true--some say it was Lady Cadogan who brought them to England. But that's not really here or there except to explain the name. At any rate, these little pots, which only hold about a cup, were then adapted and manufactured in the English potteries. Many Victorian examples were larger, brown and with the figure of a squirrel on top. As you can see, there is no lid. Yet it pours out liquid. How can that be? The secret of how they work can be seen in this modern glass one. Inside, an inverted funnel shape is the key. 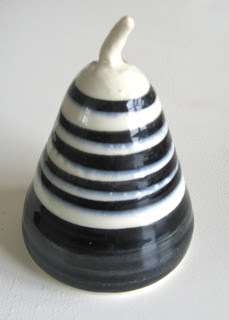 The wide part of the funnel is part of the base; the small opening is at the top. The liquid that was poured into the top when the vessel is inverted will pool into the bottom of the pot. 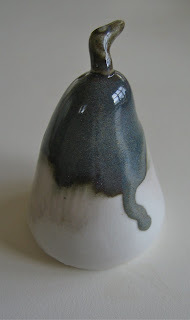 The liquid cannot rise higher than the top of the funnel-opening. 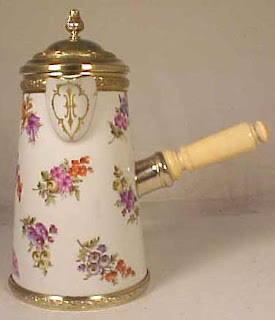 The pot can be filled as high as the inside funnel and up part of the spout. 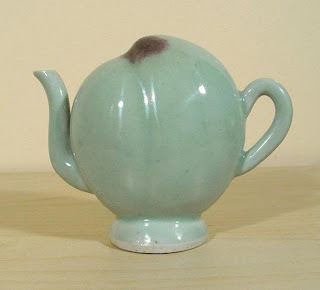 The bottom of the spout is located rather low on the pot for this reason. For the potter, they are easier to make than you would think. The trick is to make the inner funnel first, then pull the outer walls of the form up around it, leaving the inner cavity fat at the bottom and closing the vessel in at the top. 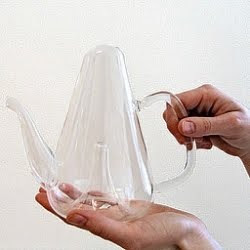 The spout is attached just the same as with a regular teapot, but you must smooth the inner seam without being able to see it. Here's one I made and (hopefully) it will be accepted into a show coming up. 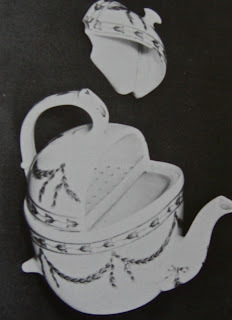 I have a wonderful book on Wedgewood. I bought it in the UK years ago. 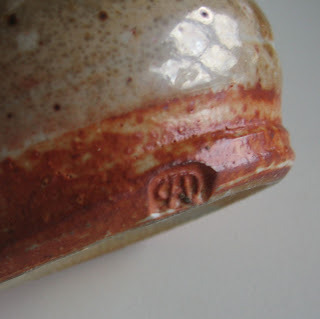 It shows many unusual clay things made during the history of the company. Like and egg-shaped bell pull. Or how about a Georgian Period egg beater? This one just kills me. It's a tilt teapot. It is meant to sit two different ways. See the separate compartment at the top of the pot? It has tiny holes in the bottom or floor of the compartment. This is where the loose tea leaves go. Then, the pot is filled with hot water and tilted backward toward the handle. What you cannot see are additional feet at the back. They are designed as a separate set of legs to hold the pot when it is tilted backward. The hot water flows into the top/back compartment through the strainer holes and over the tea leaves. When the tea has steeped and ready to pour, the pot would be set upright again as shown, the water would flow away from the tea leaf section into the body of the pot. You would certainly have to hold onto that lid. Seems like an awful lot of trouble for what appears to be maybe one or two cups of tea. 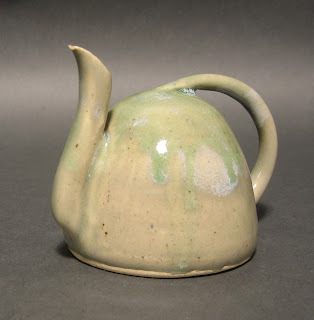 While surfing the web for spout examples, I ran across these pots. And pots they truly are! 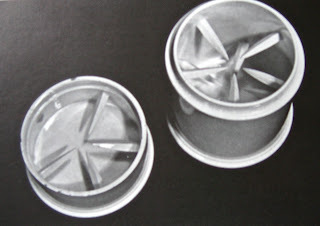 These are "Coach Pots" or "Bourdaloues". 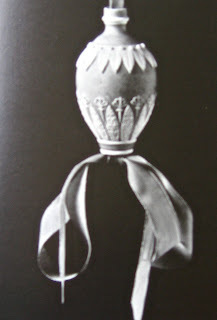 They are also sometimes called "Banquet","Crinoline", "Ball" or "Sermon Pots". They originated in France during the reign of Louis XIV. It seems the court priest, Louis Bourdaloues was known for his hours-long sermons. And of course, everyone who was in court was expected to attend his services. The ladies, arrayed in elaborate dresses and petticoats, could not exit to use the facilities without causing a noticeable disturbance, so the use of these little porcelain pots came into use. Thank heavens for discreet ladies' maids. Today, these little pots command very high prices at antique sales and auctions. In all the museums I've visited I have never seen one. But then, of course, they were not made over a long period of time. The one pictured at the left was manufactured in England. When my husband was a young junior Naval officer and we were stationed in Norfolk VA, I was asked to help at a big reception in the Officer's Club on base. The club was a neo-classical, columned building which had been a part of the 1907 Jamestown Exhibition, built on what was then Sewell's Point. Many beautiful and some extravagant buildings were built at the time prior to making it into a Naval base. The O'Club and some buildings from the Exhibition survive to this day. The main room of the club was appropriately impressive and was set up with a large table at one end. 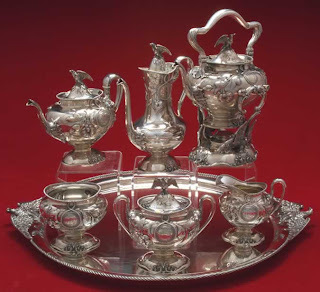 Placed at each end of the table was a massive silver service, much like the one pictured. One end was for coffee, the other for tea. In between was a sea of white and gold-banded teacups and plates of hors d'oeuvres. I had arrived in my Sunday-best clothes and was asked to sit at one end of the big table and man the coffee pot. And MAN is the operative word here! That puppy was heavy. I began serving coffee sitting, but being 5'2" tall meant that I had to lift that pot high enough to aim the spigot at a cup and not spill a drop. It became immediately apparent this wasn't going to work, so I stood to serve. I was very amused when the lady 'way at the other end of the table stood up also. New pots of hot coffee were brought out from the kitchen to recharge the pot. By the time my 2 or 3 hours were up, I really felt like I had had a workout! So let me explain about these silver services. It had been the tradition that early in the Navy's history, large, heavy tea services were part of every major ship and base's equipment for entertaining visiting dignitaries and for important social events. (The service pictured here is one from a battleship*.) They were often made special order from major silver manufacturers and double or triple plated to protect from them the corrosive sea air. While ships were deployed, many times replacement pieces or special pieces were contracted for in the place the ship was moored. 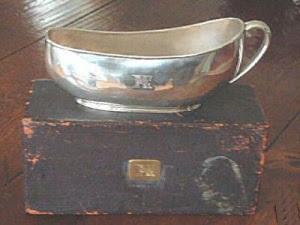 For instance, several years ago I found a set of silver finger bowls with the Naval insignia impressed on the sides. Admiral's messes also had special-order china with the Navy crest and gold banding; heavy silverware was used in the officer's mess. My children thought it was a real treat to have dinner with the officers in the mess when my husband was also standing watch for a night. They learned early how to handle so many spoons and forks. They remember it now as very special and it was. 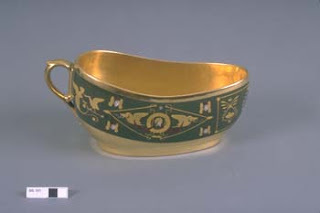 Today's military does not separate officers from enlisted personnel for food service and the clubs serve combined ranks these days, so many of these heavy silver tea and coffee services are now either in museums, or, in the case of battleships, they have gone back to the state for which the ship was named. *This set is from the battleship North Carolina. Here's a pot that just disproved all my great theories about handles and spouts. It looks like a beer stein/chocolate/coffee pot. Just proves you can find anything on the internet. But you know, here's the great thing about clay: You can make it into just about Anything. Whatever you can spin up in your cranium, you can figure out how to make with clay. 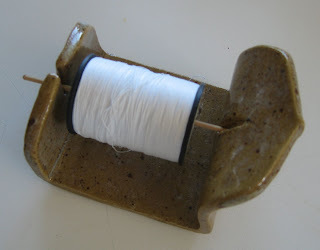 For instance, while I was doing a lot of quilting, I got tired of picking up the thread spool, cutting it off in lengths of thread, putting it down, then threading the needle. Sometimes the spool would get misplaced and I'd have to look for it. 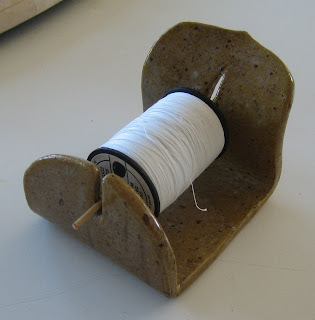 I made a little clay spool spinner/holder that could sit on a table next to me and I could whirr the thread off the spool with less fiddling. A bamboo skewer, cut short, fits into a long hole at one end; the other end of the skewer slides down in the opposite side slit. 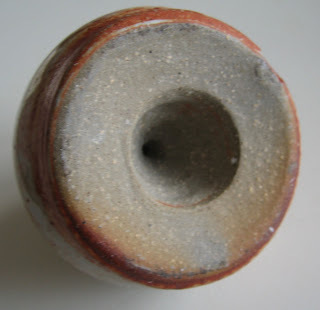 The extension of clay at one end serves as a small handle.